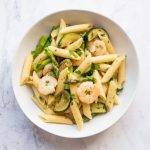 A twist on tradition; this easy carbonara recipe is filled with prawns, courgette and asparagus and flavoured with parsley and lemon. Yum! Cook your pasta as per the packet instructions. While your pasta is cooking break the eggs into a bowl with the parmesan and pepper, and whisk together. Warm the olive oil in a frying pan on a medium heat. Add the courgette and asparagus and cook for 4-6 minutes, turning occasionally, until lightly browned and tender. Transfer the vegetables to a bowl and set aside. Add the prawns to the pan and cook for 2-3 minutes on each side until pink and cooked through. When the pasta is cooked, drain the water, saving a cup full. Add the pasta to the frying pan along with the vegetables and a tablespoon of the pasta water, mix everything together. Turn off the heat and wait 30 seconds for the pan to cool slightly. Then add your egg and parmesan mixture to the frying pan and toss everything together. If the sauce looks too thick add some more of the pasta water. You want a glossy sauce that clings to the pasta. Mix in the parsley and lemon juice and serve in bowls. Enjoy!